https://researchers.anu.edu.au/researchers/maley-wl) at Cisarua Refugee Learning Center. Professor William Maley is also Vice-President of Australian Refugee Council. He was so kind to spend some time talking with our students and answered their questions. It was a great opportunity for our students to get an inspiration from a prominent Australian personality, like Professor Maley. We understand Professor Maley was in a short trip to Indonesia but still spared a time to spend his precious moments with us. We definitely got extracts of 40 years of experience and wisdom in one single day. 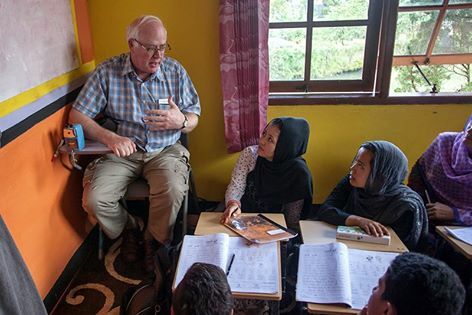 Words cannot express our gratitude to Professor William Maley that he came, spent few time with us, shared his knowledge and experience with our students and us and also encouraged our students for working even harder.